Pendimethalin and trifluralin are commonly used in many countries to control broadleaf weeds and grassy weed species because of their inhibitor effects on growth and cell division. In this study, we examined the apoptotic and anti-apoptotic potentials of pendimethalin and trifluralin on A549 human non-small lung cancer cells with several concentrations in vitro. The expression levels of apoptosis-related genes BCL-2, BAX, CAS3, CAS9, P53, BIRC, and PPIA were examined using quantitative RT-PCR after 24 h treatment of 1, 10, 50, 100 and 500 μM pendimethalin and trifluralin. The effects of pendimethalin were found more repressive than trifluralin on all studied concentrations. Twenty-four hours’ exposure with 100 μM pendimethalin and trifluralin altered the gene expressions, suppressing apoptosis and allowing cancer cells to grow and proliferate. Care should be taken not to exceed the permissible values and residue limits in food during pendimethalin and trifluralin use in order to reduce the possible carcinogenic effects on humans. In this study, we measured the expression levels of P53, BAX, BCL-2, CAS3, CAS9, BIRC, and PPIA (housekeeping) genes related to apoptosis on A549 human lung carcinoma cells after exposure to pendimethalin and trifluralin, which are two commonly used dinitroaniline herbicides. Pendimethalin is highly soluble in oil and organic solvents.22 The solution was prepared in a dimethyl sulfoxide (DMSO):olive oil (1:3, v/v) mix. Trifluralin is soluble in organic solvents and less soluble in water.23 The trifluralin solution was prepared in PBS (1% DMSO). Dulbecco’s Modified Eagle’s medium with 10% fetal calf serum and a 1% penicillin-streptomycin mixture were used as the cell culture medium. A549 cells were cultured in a 25-cm2 cell culture flask and transferred to a 75-cm2 flask after 24 h under the conditions of 5% CO2 and 37°C. After 24 hours, the cells were harvested and transferred to 6-well plates as 10,000 cell/2 mL medium of each. Cell counts were performed using Tripan blue (0.4% w/v in distilled water) in a Neubauer Chamber. One day later, when the cell count multiplied 2 folds and reached 20,000/well, pendimethalin and trifluralin solutions were added to the wells, the final concentrations were 1, 10, 50, 100 and 500 µM. These concentrations were chosen according to their 50% inhibitory concentration (IC50) and toxicity levels.24-27 The cells were incubated for 24 hours and harvested from the wells and centrifuged at 1200 rpm for 5 min. RNA isolation were performed using an RNeasy Mini Kit, QIAGEN in accordance with the manufacturer’s instructions. In brief, after centrifugation, the cell suspension was filtrated from the gDNA eliminator column, then transferred and attached to the RNeasy spin column and washed with the solutions as instructed. The amount and quality of the eliminated RNA samples were measured using Maestrogen Nanodrop. For this measurement, 1 µL of the sample was loaded to the base portion fiber terminal. All the samples’ OD 260/280 ratios were found in the range of 1.6-1.8. The cDNA synthesis was performed from the RNA samples with RT2 First Strand Kit, QIAGEN as per the manufacturer’s instructions. The RNA samples were denaturized at 42°C for 5 min in a real-time quantitative reverse transcription polyeramse chain reaction (qRT-PCR) device. The samples were placed on a cold surface to protect the linearity. Then reverse-transcription enzymes were added and the cDNA synthesis process was performed at 42°C for 15 minutes and 90°C for 5 minutes. Newly synthesized cDNA samples were stored at -20°C. 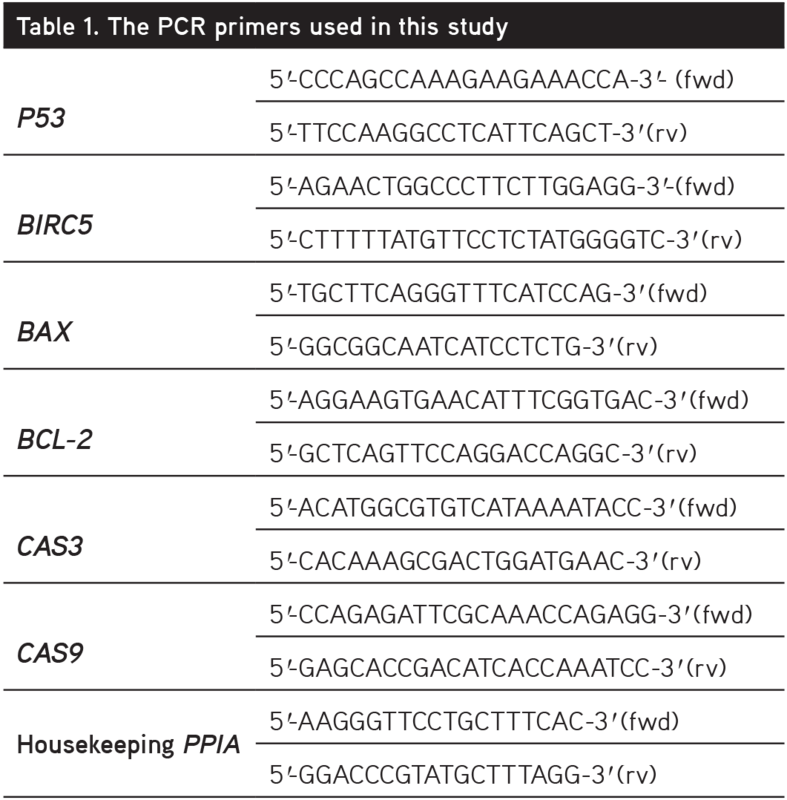 The PCR primers used in this study are listed in Table 1. To measure the expression levels of apoptosis-related genes, cDNA samples were mixed with RT² qPCR primers (BCL-2, BAX, CAS3, CAS9, P53, BIRC and PPIA), RT² SYBR Green qPCR mastermix, and expression was performed using the qRT-PCR device under the conditions of hold 95°C 15 min, cycle 95°C 15 sec and 60°C 30 sec, for 40 cycles. The results were recorded at 60°C. The threshold limit was set to 0.05 and the Ct values of the samples were calculated. The results of this article were prepared on performed in vitro cultured cells study. Therefore, there is no need for ethics committee approval. 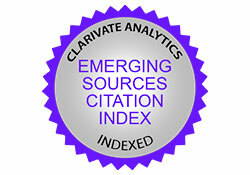 Statistics of the Ct values were prepared with an internet-based program RT2 Profiler PCR Data Analysis 3.5. ΔΔCt was used to interpret the gene expression data.28 All experiments were performed twice. The results are presented in Tables 2, 3, 4, 5, 6, 7. 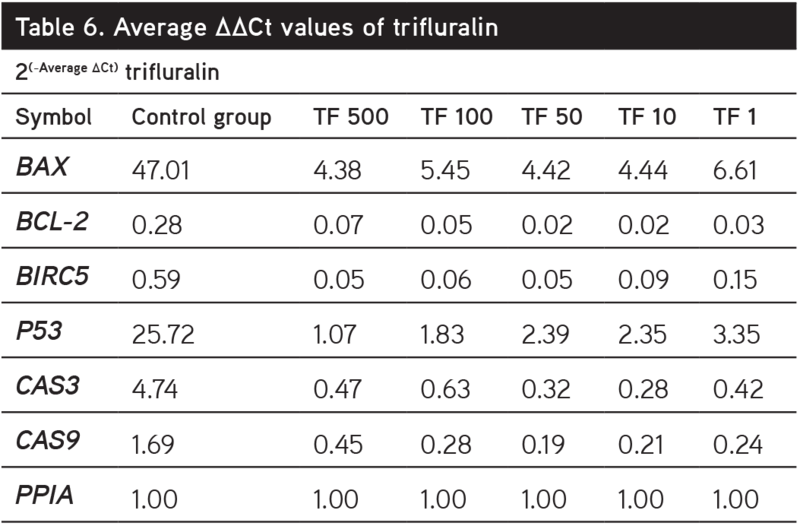 Due to the fold regulation results of trifluralin, all gene expressions were down-regulated at the examined concentrations (1-500 µM). 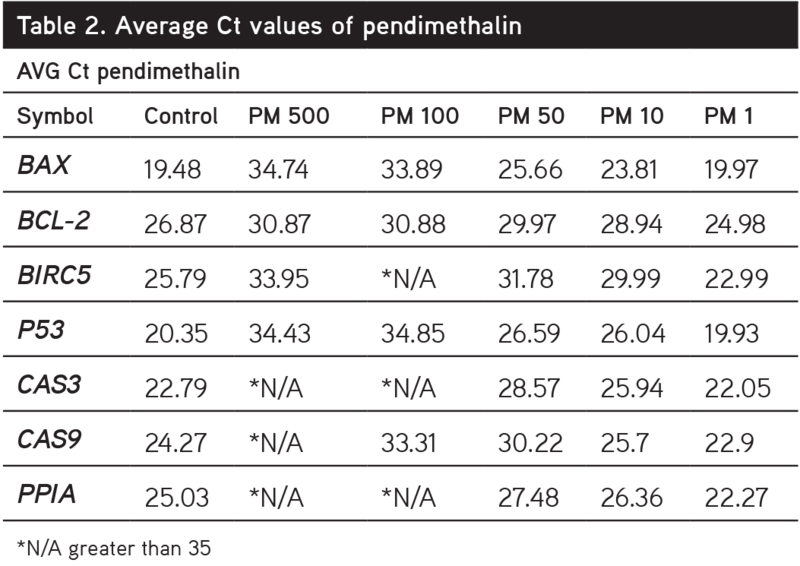 However, pendimethalin showed different regulation profiles in the same genes. The concentrations of 100 and 500 µg/mL, BCL-2 gene, and on 500 µg/mL BIRC5 gene expressions were found up-regulated compared with the PPIA control gene, whereas other concentrations of pendimethalin the examined genes are down-regulated. Pesticide use has brought about both positive and negative results on human health and the environment. They led to an increase of the amount and quality of agricultural products, along with various health problems and disruption of the soil and water. In this study, we determined the changes of apoptosis-related gene expressions with dinitroaniline herbicides. 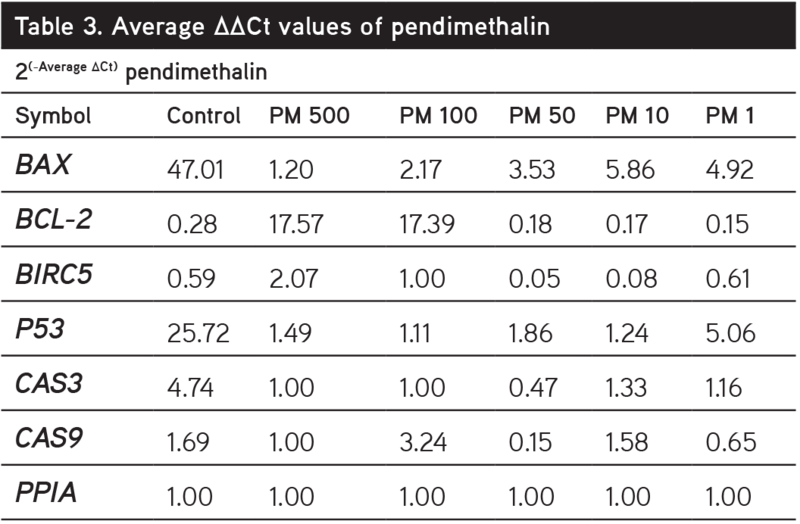 After 24 h of incubation, at the concentration of 100 µM, pendimethalin significantly down-regulated BAX, P53, and CAS3. Although CAS9 levels showed no significant change, BCL-2 and BIRC5 levels were up-regulated with pendimethalin exposure. On the other hand, trifluralin exposure down-regulated all examined gene levels at all concentrations. It has been shown that P53 is essential for normal cell apoptosis regulation because of its ability to control BAX regulation - the proapoptoic member of the BCL-2 family.29 Decreased P53 levels gave rise to cellular viability, lifespan, and chromosomal instability.30 It can be stated that increased BCL-2 expressions come with a decrease of P53 and BAX levels and prevent A549 cells from entering apoptosis. Also, BAX can induce caspase activation and increase cellular reactive oxygen species (ROS) by caspase cleavage.31 Studies demonstrated that CAS3 activation mediated the BAX-mediated pro-oxidant effects32 and had an important role on inducing apoptosis via the mitochondrial cascade.33 In our study, CAS3 expressions were found down-regulated with BAX, which in turn lowered the probability of apoptosis on A549 non-small lung cancer cells. BIRC5 (survivin) showed different effects with herbicide exposure at the concentration of 100 µM. Although pendimethalin caused up-regulation, trifluralin exposure down-regulated BIRC5 levels significantly. It is known that BIRC5 is responsible for cell division regulation during the G1-S phase and it is also considered for anticancer therapies.37 Expressed levels of BIRC5 were found higher than in normal healthy cells in various tumors such as lung, breast, ovarian, and prostate cancers.38-41 One study stated that BIRC5 silencing suppressed cell proliferation in A549 non-small lung cancer cells.38 Compared with our results, we can state that even though pendimethalin reduced apoptotic cycles with BIRC5 up-regulation, trifluralin exposure could not deactivate programmed cell death in A549 cells at the BIRC5 level. According to our findings and those of previous studies, pendimethalin and trifluralin exposure resulted with reduced-apoptosis, which in turn lead to tumor growth in A549 cells in vitro. As stated before, both herbicides significantly changed the expression levels, but pendimethalin had more effects on anti-apoptosis than trifluralin. This study found that tumor suppression genes can be altered by environmental exposure and further studies will enlighten us about the connection between dinitroaniline herbicides and lung cancer. This work was supported by the Hacettepe BAP under Grant number 1603. Wallace DR. Trifluralin in Encyclopedia of Toxicology. In: Wexler P, ed. Encyclopedia of Toxicology, 3rd ed. Oxford; Academic Press; 2014:388-389. Agronomy 317, Intro to Weeds, “Dinitroanilines”, Accessed: 03.02.1017, Available via “http://agron.iastate.edu/-weeds/Ag317-99/manage/herbicide/dnas.html”. T.C. Milli Eğitim Bakanlığı, Çevre Sağlığı, Pestisitler, 850 CK 0054, Ankara, 2012. Kegley S, Hill B, Orme S. Pendimethalin. PAN Pesticide Database, Pesticide Action Network, North America, San Francisco, CA. Accessed 23.12.2015, Available via” http://www.pesticideinfo.org”. US Environmental Protection Agency (US EPA), R.E.D. Facts: Pendimethalin, US EPA; Washington DC; 1997. Zimmermann KC, Green DR. How cells die: Apoptosis pathways. J Allergy Clin Immunol 2001;108:99-103. Martin SJ, Green DR. Protease activation during apoptosis: death by a thousand cuts? Cell. 1995;82:349-352. Riedl SJ, Shi Y. Molecular mechanisms of caspase regulation during apoptosis. Nat Rev Mol Cell Biol. 2004;5:897-907. Vermeulen K, Van Bockstaele DR, Berneman ZN. Apoptosis: mechanisms and relevance in cancer. Ann Hematol. 2005;84:627-639. Kataoka S, Tsuruo T. Physician Education: Apoptosis. Oncologist. 1996;1:399-401. Wei MC, Zong WX, Cheng EH, Lindsten T, Panoutsakopoulou V, Ross AJ, Roth KA, MacGregor GR, Thompson CB, Korsmeyer SJ. Proapoptotic BAX and BAK: a Requisite Gateway to Mitochondrial Dysfunction and Death. Science. 2001;292:727-730. Cory S, Adams JM. The Bcl2 family: regulators of the cellular life-or-death switch, Nat Rev Cancer. 2002;2:647-656. Hussain SP, Harris CC. Molecular epidemiology of human cancer: contribution of mutation spectra studies of tumor suppressor genes. Cancer Res. 1998:58:4023-4037. Chi CC, Chou CT, Liang WZ, Jan CR. Effect of the pesticide, deltamethrin, on Ca2+ signaling and apoptosis in OC2 human oral cancer cells. Drug Chem Toxicol. 2014;37:25-31. Raszewski G, Lemieszek MK, Lukawski K, Juszczak M, Rzeski W. Chlorpyrifos and cypermethrin induce apoptosis in human neuroblastoma cell line SH-SY5. Basic Clin Pharmacol Toxicol. 2015;116:158-167. Jang Y, Lee AY, Jeong SH, Park KH, Paik MK, Cho NJ, Kim JE, Cho MH. Chlorpyrifos induces NLRP3 inflammasome and pyroptosis/apoptosis via mitochondrial oxidative stress in human keratinocyte HaCaT cells. Toxicology. 2015;338:37-46. Banerjee BD, Seth V, Ahmed RS. Pesticide-induced oxidative stress: perspectives and trends. Rev Environ Health. 2001;16:1-40. Li Q, Kobayashi M, Kawada T. Carbamate pesticide-induced apoptosis and necrosis in human natural killer cells. J Biol Regul Homeost Agents. 2014;28:23-32. Nick P. Control of plant shape, In Plant Microtubules: Potential for Biotechnology. Nick P, ed. Berlin- Heidelberg; Springer Berlin-Heidelberg; 2000:25-50. Tresch S, Plath P, Grossmann K. Herbicidal cyanoacrylates with antimicrotubule mechanism of action. Pest Manag Sci. 2005;61:1052-1059. Dimitrov BD, Gadeva PG, Benova DK, Bineva MV. Comparative genotoxicity of the herbicides Roundup, Stomp and Reglone in plant and mammalian test systems. Mutagenesis. 2006;21:375-382. Patel S, Bajpayee M, Pandey AK, Parmar D, Dhawan A. In vitro induction of cytotoxicity and DNA strand breaks in CHO cells exposed to cypermethrin, pendimethalin and dichlorvos. Toxicol In Vitro. 2007;21:1409-1418. Zaidenberg A, Marra C, Luong T, Gomez P, Milani L, Villagra S, Drut R. Trifluralin toxicity in a Chagas disease mouse model. Basic Clin Pharmacol Toxicol. 2007;101:90-95. Weir SM, Yu S, Salice CJ. Acute toxicity of herbicide formulations and chronic toxicity of technical-grade trifluralin to larval green frogs (Lithobates clamitans). Environ Toxicol Chem. 2012;31:2029-2034. Livak KJ, Schmittgen TD. Analysis of Relative Gene Expression Data Using Real-Time Quantitative PCR and the 2−(-Delta Delta C(T)) Method. Methods. 2001;25:402-408. Fridman JS, Lowe SW. Control of apoptosis by p53. Oncogene. 2003;22:9030-9040. Lowe SW, Lin AW. Apoptosis in cancer. Carcinogenesis. 2000;21:485-495. Ricci JE, Munoz-Pinedo C, Fitzgerald P, Bailly-Maitre B, Perkins GA, Yadava N, Scheffler IE, Ellisman MH, Green DR. Disruption of mitochondrial function during apoptosis is mediated by caspase cleavage of the p75 subunit of complex I of the electron transport chain. Cell. 2004;117:773-786. Kirkland RA, Franklin J. Bax and caspases regulate increased production of mitochondria-derived reactive species in neuronal apoptosis: LACK of A role for depletion of cytochrome c from the mitochondrial electron transport chain. Biochem Biophys Rep. 2015;4:158-168. Chakraborty S, Mazumdar M, Mukherjee S, Bhattacharjee P, Adhikary A, Manna A, Chakraborty S, Khan P, Sen A, Das T. Restoration of p53/miR-34a regulatory axis decreases survival advantage and ensures Bax-dependent apoptosis of non-small cell lung carcinoma cells. FEBS Lett. 2014;588:549-559. 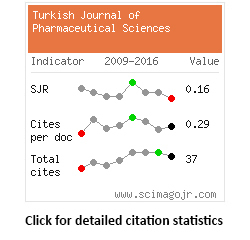 Srinivasula SM, Ahmad M, Fernandes-Alnemri T, Alnemri ES. Autoactivation of procaspase-9 by Apaf-1-mediated oligomerization. Mol Cell. 1998;1:949-957. Cepero E, King AM, Coffey LM, Perez RG, Boise LH. Caspase-9 and effector caspases have sequential and distinct effects on mitochondria. Oncogene. 2005;24:6354-6366. Brentnall M, Rodriguez-Menocal L, De Guevara RL, Cepero E, Boise LH. Caspase-9, caspase-3 and caspase-7 have distinct roles during intrinsic apoptosis. BMC Cell Biol. 2013;14:1-9. Wheatley SP, McNeish IA. Survivin: a protein with dual roles in mitosis and apoptosis. Int Rev Cytol. 2005;247:35-88. Monzo M, Rosell R, Felip E, Astudillo J, Sanchez JJ, Maestre J, Martin C, Font A, Barnadas A, Abad A. A novel anti-apoptosis gene: Re-expression of survivin messenger RNA as a prognosis marker in non-small-cell lung cancers. J Clin Oncol. 1999;17:2100-2104. Tanaka K, Iwamoto S, Gon G, Nohara T, Iwamoto M, Tanigawa N. Expression of survivin and its relationship to loss of apoptosis in breast carcinomas. Clin Cancer Res. 2000;6:127-134. Krajewska M, Krajewski S, Banares S, Huang X, Turner B, Bubendorf L, Kallioniemi OP, Shabaik A, Vitiello A, Peehl D, Gao GJ, Reed JC. Elevated expression of inhibitor of apoptosis proteins in prostate cancer. Clin Cancer Res. 2003;9:4914-4925. Xing J, Jia CR, Wang Y, Guo J, Cai Y. Effect of shRNA targeting survivin on ovarian cancer. J Cancer Res Clin Oncol. 2012;138:1221-1229.